The Office@Hand Hot Desking feature allows your users to share a common phone. Hot Desking allows Users to log in to a shared Office@Hand desk phone remotely—and use it like their own—with access to their personal extension, saved settings, voicemail, and more. User will be prompt to enter the extension number and a pin (Soft key + Ext +Pin). Press Logout soft key on the phone or dial *91 to log out. 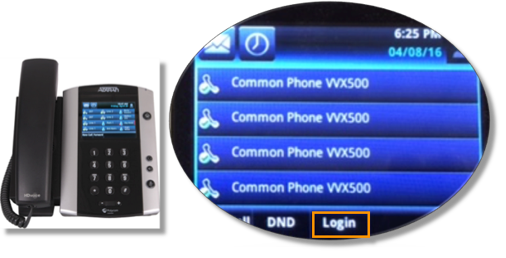 Go to Phone System > Phones & Devices. Go to Common Area Phones and select the Common Phone you want to log out. Note: When a common phone is not logged in remotely, dialing emergency service is allowed from the phone.